I want to preface this post by saying that I am not speaking out against any political parties or the United States. I have tried very diligently to remain staunchly apolitical, both here and on other social media. I do so because I don’t want any of my personal opinions to dissuade you from the Gospel. Meaning I will never endorse any candidates or political parties, simply because politics will never matter in the context of this blog or my ministry. I’m not trying to change your political views or say that they’re wrong, so please do not take what I’m writing the wrong way. That being said, I’m bringing up a topic that might ruffle some feathers, and that’s OK. I hope that whoever is reading this will receive it in the spirit that it is written, as an exercise in exploring the intersection of our faith and culture, to God be the glory. I would love to hear your thoughts on the subject, so please feel free to leave a comment at the end. And if you enjoyed this post, please share it with your friends. I believe this is a conversation that is worth having. I’ve lived in Metro Atlanta for over a decade. Moving here from the Midwest, it has been interesting to live in a culture where faith is so freely worn on people’s sleeves. Here you’ll find framed prayers on desks, ichthus badges on the minivan (next to the Christian school magnet,) and devotion to all things Chick-fil-a. With the exception of a few pockets in the state, Georgia is unashamedly conservative, the most recent evidence being an approximate eight point spread between Obama and Romney in the 2012 presidential election. And it is no surprise that as a dominantly conservative state, patriotism is equally represented. We love America. We love our soldiers; we love what they stand for. We love taking our patriotism, sticking it in a blender with our NIV bible, Chick-fil-a sandwich, and Chris Tomlin CD, hitting frappe, and pouring out our smoothie into a church-shaped glass. If you think that’s an overstatement, consider the statistics. As reported by USA Today, according to a survey conducted by the Public Religion Research Institute in partnership with Religion News Service, “When it comes to God and country, white evangelicals report the most intense patriotic feelings . 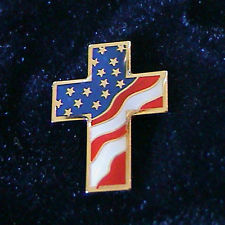 . . with more than two-thirds (68 percent) saying they are extremely proud to be an American.” That same group is “more likely than any other religious group surveyed to believe that God has granted the U.S. a special role in history (84 percent).” Those same evangelicals will likely also hold equally strong views on topics such as immigration, gun, and drug laws. I’m not suggesting that the conservative opinions on these views are inherently wrong. In fact I’m not passing judgment on them at all. But there is a bit of a theological quandary that needs to be discussed. There’s a sort of “chicken or the egg” problem when it comes to our faith. On one hand we have a fully developed political preference. I believe what I believe; there is no truth but the ________ Party, my political beliefs will not be shaken, and America is the ________ country ever. On the other hand we have the Gospel, the Good News. We have salvation by grace through faith. We have freedom in Christ, for “It is for freedom that Christ has set us free.” (Gal 5:1-15.) I wonder, and what I would like you to honestly ask yourself, is which one of these comes first? Which one influences the other; do your politics influence your understanding of the Gospel, or does the Gospel compel you to hold a certain political belief. N.T. Wright begins the chapter on Worship in his book, Simply Christian: Why Christianity Makes Sense, with the idea that “when we begin to glimpse the reality of God, the natural reaction is to worship him. Not to have that reaction is a fairly sure sign that we haven’t yet really understood who he is or what he’s done.” I think we are drawn to what we are devoted to, which is fine. My concern is what gets top billing. And if we choose to steep our faith through the fabric of a flag rather than savoring the full flavor of the Gospel, we shortchange the message we both receive and distribute. Meaning we run the risk of misrepresenting (and misinterpreting) God’s Word. And if the good Bishop is correct in saying that our worship (a word which I will hijack to include devotion and interpretation of scripture) is colored by something as subjective as our political opinion, then perhaps we don’t really understand what it is God has done for us, and more to the point, how God wants us to respond. The older I get, the more I realize that narrow though the path to salvation is, there’s a big tent we’re all hanging out under. And inside that tent you’re going to find an abundance of ideas, opinions, and ideologies that you probably won’t agree with. That’s just how things go. Obviously the Church has been fractured by schisms and rifts over the past two millennia, resulting in divided congregations and new denominations. And sometimes those ideas are damaging, despite their overwhelming popularity. But our responsibility lies not in our opinions but in the Gospel. And if we are filtering our understanding of how God works through our personal bias, are you really left with the Gospel, or just a shallow husk of what God intended? And what does that communicate to the world? This is a. good post, Chris, but even though much what you say applies to me, the underlying assumption really doesn’t and I don’t think I am alone. I am, indeed, virulently patriotic, and way out on the Calvinist end of the evangelical spectrum, but my loyalty to my country is complicated and comes with strong qualifications. I grew up outside the U.S. as a missionary kid, so I have a lot of first hand experience with other cultures and other governments. Because of this, I neither romanticize other countries and cultures – as liberals do, nor do I despise and look down on other countries and cultures – as some conservatives do. I know other countries and cultures because I have lived in them. My family has been in this country practically forever. Some of my ancestors were native American. My “white” ancestors came here in the first waves of immigration in early 1600s. My association with this land is quite a bit older than the United States. As far as I can tell, none of my family came here in the later waves of immigration that were primarily economic. All that to say this, my family really did come here for freedom – primarily religious freedom. We were part of religious minorities in the British Isles. Some of my ancestors were Puritans in the time of Charles the First. Others of my ancestors were Scots Presbyterians fleeing the conflict in parts of Scotland and Ireland. Why all this background? Because I think that the reasons that this country was founded have been ignored and forgotten. We blithely toss around the notion now that everybody is an immigrant and we all came here to make money and have a “better life”. But that isn’t true. The people who came here early did not have a better life. They had a much more terrible life, harder, more dangerous, less convenient – but free. They were willing to give up comfort and safety to be free to worship God as they chose and to chart their own course in life. So – to me – being American is about being free, especially being free to worship God as my conscience dictates, rather than about “the American way”, American culture, or any economic or technological progress or prosperity. When America stops being about freedom – especially freedom of conscience – my loyalty is correspondingly diminished. I do not believe in “my country right or wrong” – and so – some might say that I am not patriot at all. My patriotism is tied to the concept of America as expressed by our founding fathers. As imperfect as they were – and they were obviously imperfect – they had a great idea about being free to follow your conscience and to choose your own way in life. That is what I am loyal to – not to whatever current version of our government is in office. I have seen what is like to live in countries where you are not free, that is why I value the freedom that America offers. When America stops offering that freedom, then my loyalty to America ends. I have often wondered what I would do if I were faced with the choice that my ancestors had to make? What if living in the land of my birth meant that I would not be free to serve and worship God in the way that my conscience dictates? Where would I go? There are no “Americas” or “Australias” left to immigrate to. It is a troubling question. If I cannot go somewhere else to have the freedom that I value above all things, then I must do all – risk all – to keep the dream of the founding fathers and the first settlers of this land alive.